Notorious stars Cary Grant as Devlin, Ingrid Bergman as Alicia and Claude Rains as Sebastian. It was directed by Alfred Hitchcock from a screenplay by Ben Hecht and released in 1946. It is often described as one of the best spy movies ever made. Note this is a review of the 1946 spy thriller not the recent biopic of the rapper, Notorious BIG. It’s 1946. Straight-laced American agent, T.R. Devlin recruits Alicia Huberman, the self-destructive, heavy drinking daughter of a convicted Nazi spy, to infiltrate a group of German expatriates in Brazil. In Brazil, Alicia and Devlin begin an affair, but Devlin is ordered to persuade Alicia to seduce the leader of the Nazi group, Alex Sebastian. Alicia who has fallen in love with Devlin hopes he will offer her a way out, but he, unable to believe in her, doesn’t. Devlin arranges a ‘chance meeting’ between Alicia and Sebastian while horse riding. As expected, Sebastian, who has been infatuated with Alicia for years, is delighted to see her again. He invites Alicia to a dinner at his house. At the dinner, Alicia suspects there is something secret in the wine cellar. Devlin debriefs Alicia. Alicia tells him of her suspicions about the wine cellar and remonstrates with him for forcing her into the mission. He says he knew she couldn’t change her ways, upsetting her. Sebastian sees Devlin and Alicia together and suspects they are attracted to each other. Alicia tries to persuade Sebastian she loves him. He asks her to prove it by marrying him. Alicia goes to Devlin and his superiors to ask them what to do. They tell her to go ahead, although Devlin is not happy about it. Notorious has a Mission plot (see spy movie plots). 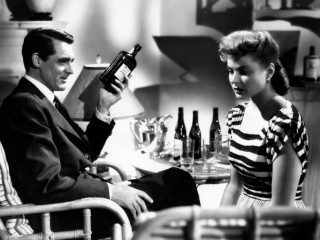 A woman seducing a man she doesn’t love on the orders of another man, who she does love but who may not love her, is a very noirish theme, but Notorious is not a true film noir. A love affair between two cynical and mistrusting people who are alienated from each other. A man who treats the woman who loves him callously and manipulates her for his own gain. A man whose love is being manipulated by a woman who cares nothing for him and who intends to betray him. Characters willing to transgress moral boundaries to reach their goals. Glamorous protagonists (Cary Grant and Ingrid Bergman). Characters being able to avoid their fate and resist the forces dragging them down. A redemptive ending for the protagonists. Fundamentally, Notorious is a romantic thriller that incorporates film noir elements. The ‘romance’ is caused by the fact that the spy mission and the characters’ misunderstandings are keeping the two would-be lovers apart. For a much more light-hearted treatment of the story of a woman infiltrating a spy organisation through romance with the mastermind see North By Northwest, also starring Cary Grant, but with the female spy played by Eve Marie Saint. Hitchcock’s movies often revolve around a ‘MacGuffin’ – an item that is of no direct plot relevance, though the characters are all searching for it or seek to possess it. In Notorious the MacGuffin is the secret in the wine cellar, which in the end could be anything. Supposedly in early versions of the screenplay it was stolen diamonds. The unresolved question of what exactly the Nazis are up to is not the movie’s strong point. Alicia is the most sympathetic character in Notorious, unable to cope with the discovery that her father is a traitor and embarking on a self-destructive binge. All she wants is a chance of redemption, something that Devlin denies her until the denouement. Sebastian is also in many ways a sympathetic character, despite being a Nazi. He is charming, attentive and eventually destroyed by his love for Alicia. His decision to kill her is the blind revenge of a man who has been betrayed and had everything taken from him. Maybe in 1946 Devlin’s attitude to Alicia would have seemed normal, but to a modern eye, his behaviour seems bizarre. He forces Alicia into the mission, and then tries to blame her and her ‘lack of character’ for accepting it. He manipulates her into a terrible position and spends the movie feeling sorry for himself because of a situation he has been instrumental in setting up. At the end he does realise what a fool he has been, saving himself from being a completely negative character. Although a staple of espionage fiction, honey traps – sending agents to seduce the enemy – are rare in reality. One notable exception was the East German spymaster Marcus Wolf, who made regular use of male ‘Romeo’ agents, who sought out West German women in sensitive positions, romanced them, and turned them into spies. The programme was so successful that eventually NATO had to start monitoring all single women in their employ to make sure they weren’t in relationships with East German spies. A great romantic thriller with a noirish edge. Recommended. Notorious is available on Amazon US here and Amazon UK here . If you’d like to discuss anything in my Notorious review, please email me. Otherwise, please feel free to share it using the buttons below.